Sometimes living, breathing history can sometimes be lost in all the facts. The names and dates quickly become stale and boring and other sources are needed to bring it to life. I personally like looking at paintings and portraits of the period to get a glimpse of the past through the eyes of the artists that lived it. The following paintings are scenes of ordinary, day to day existence during the Edwardian period. Marcus Stone was a painter and illustrator and the son of an associate of Charles Dickens, Frank Stone. Marcus was trained by his father and his work appeared in several famous writers books of the period. 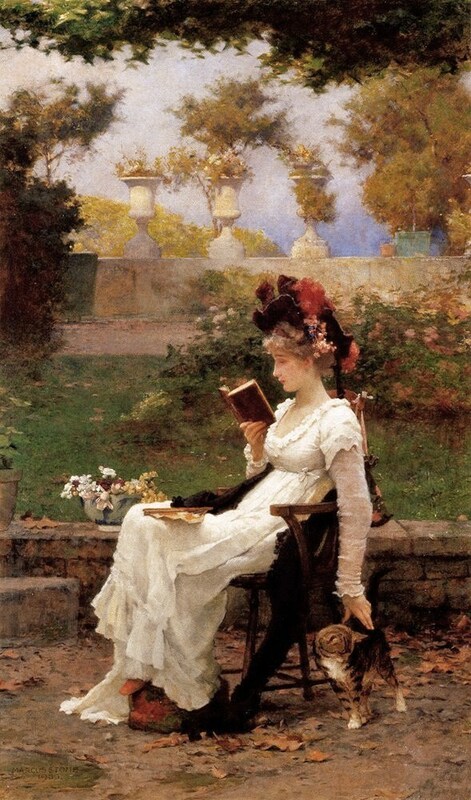 The above painting shows a woman enjoying a good book in the outdoors. Due to his ties to Dickens, could she be enjoying ‘Great Expectations’? Perhaps she is enjoying some free verse poetry? Gambling was a favorite occupation of both the upper classes and the lower classes. Titled ‘The Cheat,’ this painting by John Collier is an insight into the views and moral outlook of the times. 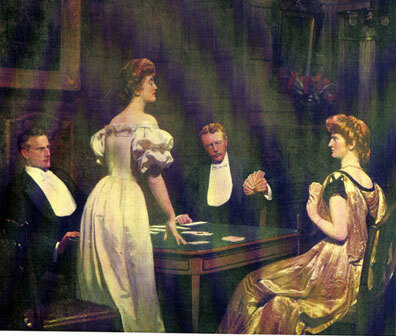 A game of cards has been disrupted by the accusation of cheating and it is a woman that has done so. It is meant to show the disintegrating morals of the upper classes and that they do not uphold the manners and etiquette they preach. What is a little cheating at cards between friends? William Powell Frith painted scenes from all aspects of Edwardian and Victorian life. 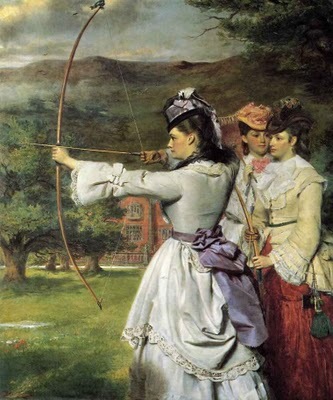 This scene shows some upper class ladies practicing their archery skills. 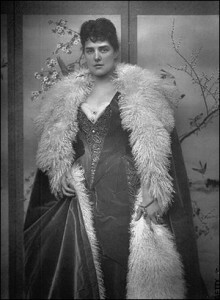 The Edwardian period allowed women to indulge in sporting activities which had once been seen as not lady-like. 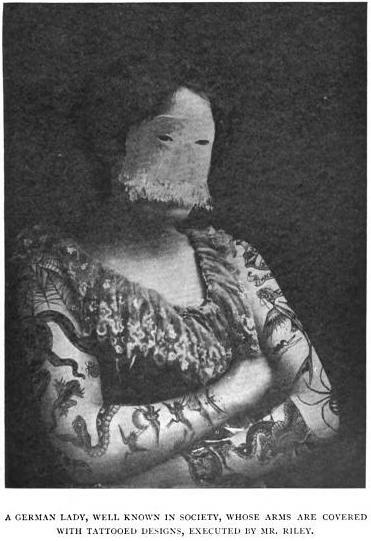 Women began to resist the restraints that had once been on them and began to experiment in areas they had not been seen before. Archery was just one of many sports which had once been men’s exclusive domain to interest women in the period and allow them to show themselves physically and mentally capable to compete in sport. 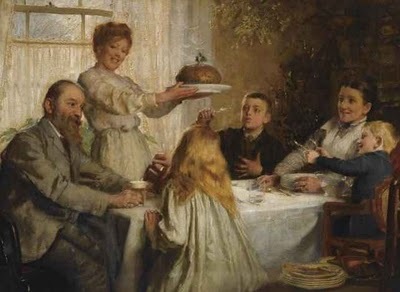 ‘Christmas Dole,’ by Joseph Clarke shows a homey scene around the dinner table and the excitement over a freshly cooked Christmas pudding. 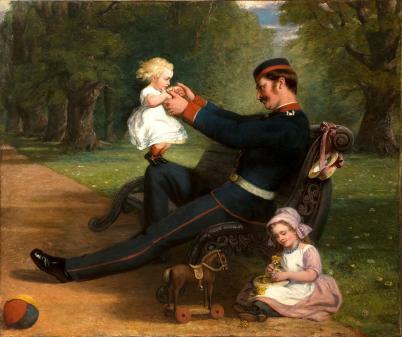 A pleasant scene painted by Marshall Claxton of a soldier’s reunion with his two little girls. It shows the simple fun of Edwardian childhood, depicting a ball and a pull along horse. The older of the two girls appears to be making a daisy chain, while the younger is being bounced on her daddy’s lap. Henry Mitton Wilson’s painting shows simple imaginative play. 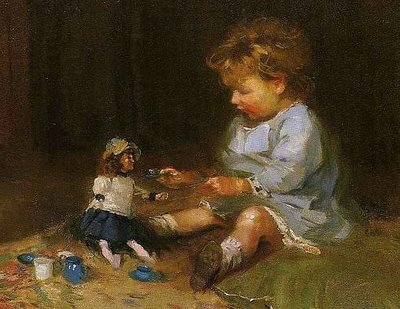 Playing tea party with the dolls is a common childhood experience which I can share with this Edwardian child. The child politely offers dolly the tea, while the doll sits patiently in its fine, tea party clothes. 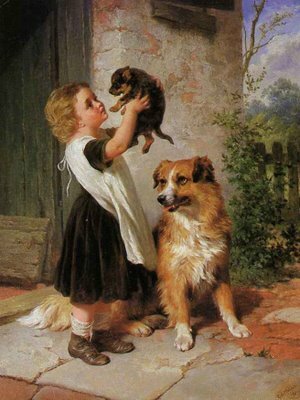 George Augustus Holmes’s painting shows the bond between a young girl and her puppy. During Edwardian times animals were slowly being seen more as pets as we view them today and less as the work animals they had been seen as in the past. The Garden Party. Sir James Guthrie HRA PRSA HRSW HROI (1859–1940). Oil on canvas, 30 x 38 inches; 76.2 x 96.5 cm. 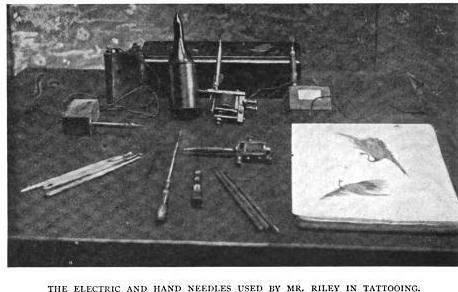 Signed and inscribed label verso. Provenance: Sir F.C. Gardiner and thence by descent. Private Collection, Scotland. 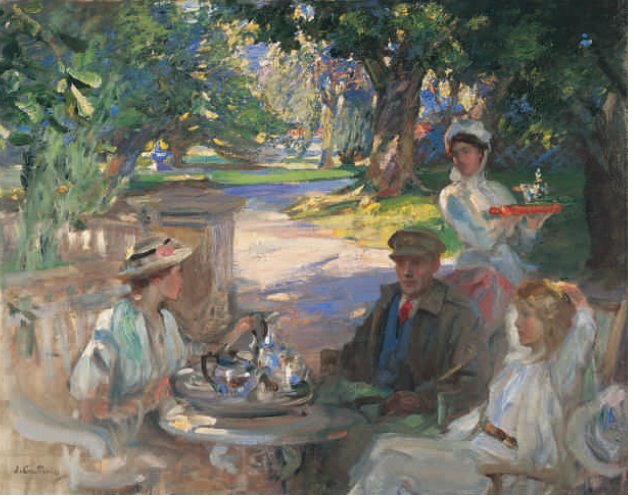 James Guthrie’s painting of an upper class family taking their tea outdoors. I love the broad brushstrokes of this painting and the way the silverware appears to shine. I thought I would include this image of poor village life in Edwardian times. 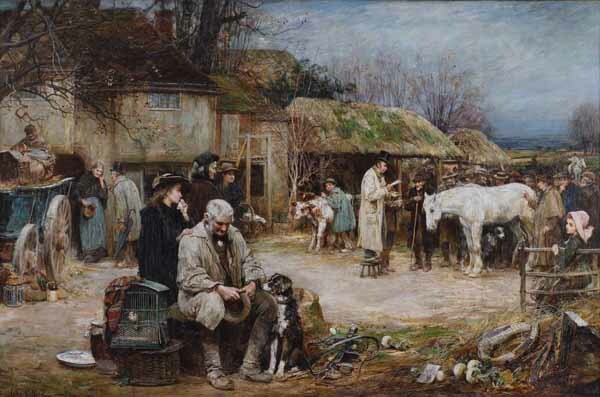 John Robertson Reid depicts the sadness of an old man at the sale of his horse. Horses were a big part of Edwardian life, useful for both farm work and for transport, a loss of a horse was a huge blow. 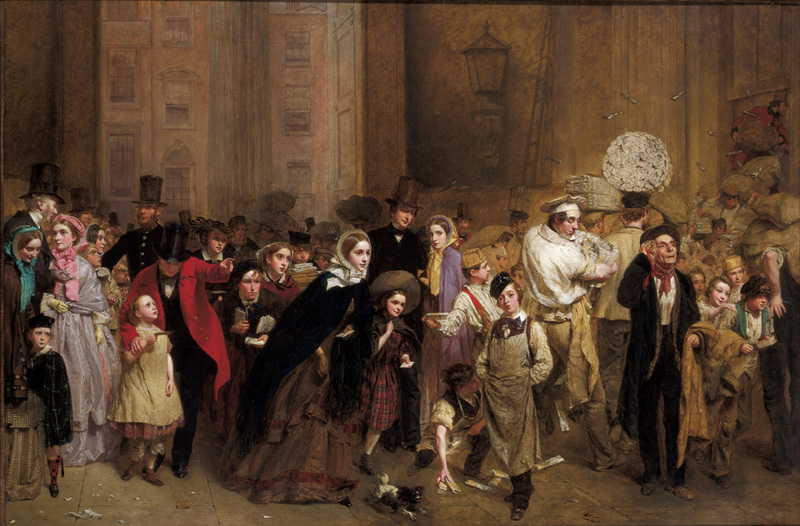 To contrast the previous image, this is William Firth’s bustling depiction of city life. Everyone is in a hurry and at some form of work. I can spot a baker, a policeman, a newspaper boy, laborers and pickpockets. There appear to be people from all walks of life and classes, all thrown haphazardly together. Hope you enjoyed looking over ten paintings of everyday life in the Victorian and Edwardian eras with me. I would love you to share with me your favorite paintings of the era and what you do to find the soul and heart behind your research.